Dental crowns are generally placed over teeth that have been treated with either root canal therapy, or a restorative filling. They closely resemble the appearance of natural tooth enamel, and provide the tooth with strength and support. Crowns help to prevent future problems, such as fracture, from occurring. Crowns can also be used for cosmetic purposes. 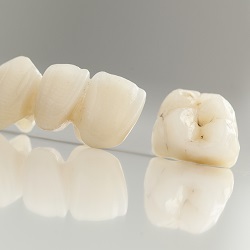 Crowns are available in a variety of different materials, including porcelain, metal, ceramic and composite. Each material offers a unique set of benefits. The dentist will help a patient determine which type of crown would be ideal for them. Dra. Dana Coman is one of the best dentists in Guelph area for Dental Crowns and Bridges and cosmetic dentistry. Dental bridges are ideal for patients with one or more missing teeth. A bridge runs over the space from an absent tooth/teeth, attaching from one healthy tooth to another adjacent healthy tooth in order to restore the empty area. In some cases, a bridge will run from a dental implant to another implant, or another healthy tooth. Bridges are permanently cemented into place and require daily cleaning and maintenance in order to keep the supporting gum in healthy condition. They are an excellent restorative solution for many patients, allowing them to return to optimal chewing and speaking function. For more information on dental crowns and bridges, contact our Guelph dentist, Dr. Coman today. Please call our office during regular hours on 519-824-8000, our staff will be happy to guide you through what to do in case of a dental emergency.